My family and I had a wonderful time. 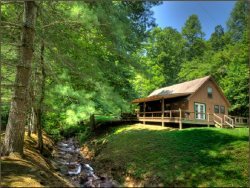 We will definitely be booking with Hidden Creek again! The location between NOC and Bryson City was perfect. Staff were very friendly, went out of their way. We had a great time, I look foward to bringing my family back for a stay. Had several questions over the 2 weeks before our visit and just emailed the owners amd had an email back within minutes. Had no problems to deal with at the property so can't address that. Wonderful property. A lovely cabin in the woods, beautiful views from the cabin porch. We really enjoyed sitting out on the porch. We usually like a washer/dryer but didn't even need that at this place. Close to Bryson City, only 5-6 miles away and what a lovely small town. Not tourist at all. The cabin was beautiful. Everything that we could possibly need was there. The back porch was a beautiful place to sit and eat or just enjoy the view. We will certainly be using your service, and especially the Oak Ridge cabin, again. I did not talk to anyone during my stay. I called and paid for the cabin and they were very friendly and helpful. The cabin was beautiful. It met all our needs. Most cabins do not have a fenced in back yard that was really nice since I took my dog. It had a hot tub pool table and jacuzzi bathtub. It was also a short drive to many cities. Our stay in the cabin was wonderful!! We have been married 23 yrs. This anniversary trip was better than all previous trips, including our honeymoon. very well kept cabin and grounds. very pleasant stay, we will make this a yearly trip. The staff members was very prompt in responding to email. My fiance and I were on our way to Bryson City from Asheville and couldn't find the directions to the cabin anywhere. I emailed them and within ten minutes I had a detailed list of directions in my inbox. The property was perfect for us and our two rowdy dogs! We live in an apartment, so having a fenced back yard was a life saver. We will definitely be staying here again this summer! Loved it!!! My family and I had a great time!!!! WE WILL DEFINETLY COMEBACK!!! Everyone was very friendly and helpful in planning our get away. The cabin was very clean! Thank you Gerti. It was stocked with all the basics except for the possibility of a pizza pan. Can't wait to come back soon for another stay.